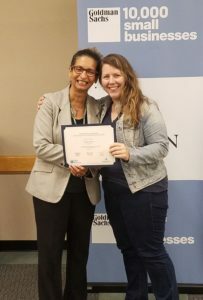 Kathryn Hubicki, President of Get the Lead Out, has completed the Goldman Sachs 10,000 Small Businesses program as part of National Cohort 7 at Babson College. As an applicant to the program, she was required to undergo a rigorous selection process which included proving a commitment to growing Get the Lead Out and creating jobs in her community. “The time I spent in 10ksb honestly changed my life. I view my company in a completely new light. It helped to illuminate what issues are keeping Get the Lead Out from expanding and provided solutions to help us eliminate those roadblocks to growth. It also reminded me what makes our company so special – our work helps to protect people from environmental hazards all around the country. Goldman Sachs 10,000 Small Businesses is an investment to help entrepreneurs create jobs and economic opportunity by providing greater access to education, capital and business support services. The program is based on the broadly held view of leading experts that greater access to this combination of education, capital and support services best addresses barriers to growth for small businesses. Goldman Sachs and the Goldman Sachs Foundation have committed $500 million to the program across the world. The national cohort is designed for business owners who are not located within driving distance of a locally delivered program. It provides a modified form of the program that is delivered through a blend of online and in-person sessions.